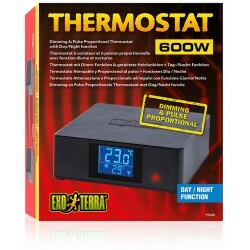 With the Exo Terra Thermostat you can create a well controlled heating system that allows you to maintain the required temperature conditions similar to those found in a desert or tropical environment. The Thermostat will also help to prevent overheating and undercooling during hot summer days or cold winter nights. Reptiles are ectotherm, and use heat from an external source to thermoregulate their optimal body temperature. Most reptiles use direct radiant heat from the sun in combination with conductive heat from sun-heated surfaces such as branches, rocks or other heat accumulating structures. Providing such an appropriate, species related, temperature gradient in the terrarium is an important factor in successful reptile keeping. With the Exo Terra 600W Dimming & Pulse Proportional Thermostat with Day/Night function you can create a well-controlled heating system that allows you to maintain the required temperature conditions similar to those found in a desert or tropical environment. The Thermostat will also help to prevent overheating and undercooling during hot summer days or cold winter nights. Both the daytime and nighttime temperatures can be set separately to guarantee safe daytime-nighttime temperature fluctuations for your reptiles. 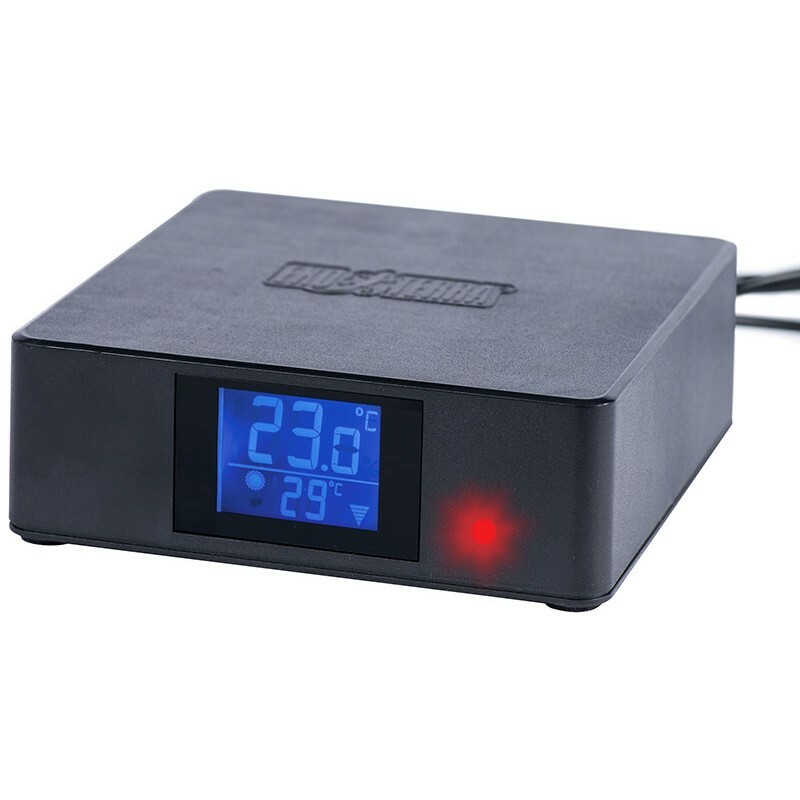 The Dimming & Pulse Proportional function keeps the temperature at the desired setpoint with a much higher accuracy than conventional thermostats and virtually eliminates temperature swings in the terrarium. The easy-to-read blue LCD screen shows actual and set temperature, and will automatically increase brightness of the LCD in day mode and use dim light when in night mode. A Red LED and a heating symbol will indicate when the heating device is switched ON. Once the set temperature is reached, the LED will switch to Blue and the heating symbol will no longer show. The temperature probe with built-in light sensor switches automatically between daytime and nighttime temperature setting, based on the light intensity. Simply connect your Heat Mat, Heat Cable, Ceramic Heater or Heat Bulb to the Exo Terra Day/Night Thermostat, set the preferred daytime and nighttime temperatures and place the heat sensor in the desired spot. The push button/dial system of the thermostat will prevent accidental changes of the set temperature if the device is being handled. The waterproof remote sensor can be safely used in highly moist terrariums and aquatic environments.